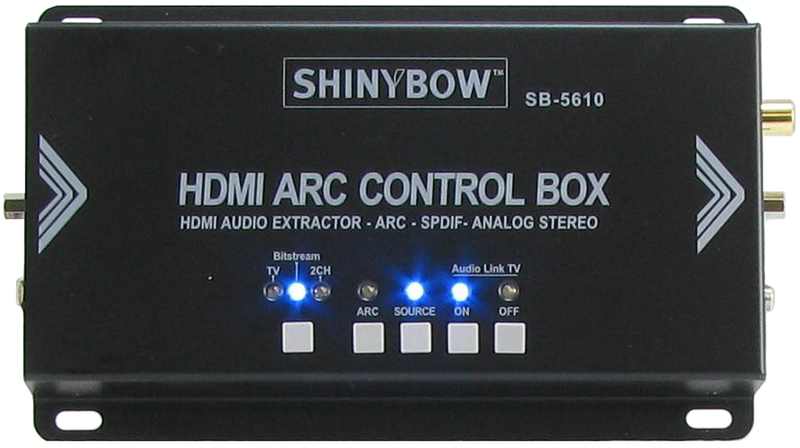 The SB-5610 is a high quality HDMI ARC Control Box with HDMI Audio Extractor supporting ARC, a SPDIF DVD Source and analog stereo. This control Box can link audio (ARC or Source SPDIF) to a TV or audio amplifier and turn ON or OFF the TV or Audio Amplifier speakers. The audio extractor supports a HDMI repeater and equalizer between the HDMI player and display. The SB-5610 supports HDMI 1.3a, 1.3c (CTS), HDMI 1.4a, 3D formats and is HDCP 2.0, DVI 1.0 compliant. Audio supports PCM 2-Channel IIS/DSD, SPDIF and HDMI outputs, Video supports 36 bit Deep Color up to 1080p-60 (225Mhz). Also supports 2-channel PCM audio at sample rates of 32/44.1/48kHz for 16 and 24 bit depths. This device allows you to extract analog audio LPCM2 and digital audio SPDIF from the HDMI signal while still sending the original audio/video signal to your HD devices. When using a display without speakers you can still extract the analog audio to external speakers or digital audio to an amplifier. SPDIF Output supports ARC or Source (HDMI Input). Analog Audio Output will always be from the Source (HDMI Input).